Submitted by Dan Dooré on Friday, May 25, 2018 - 14:39. 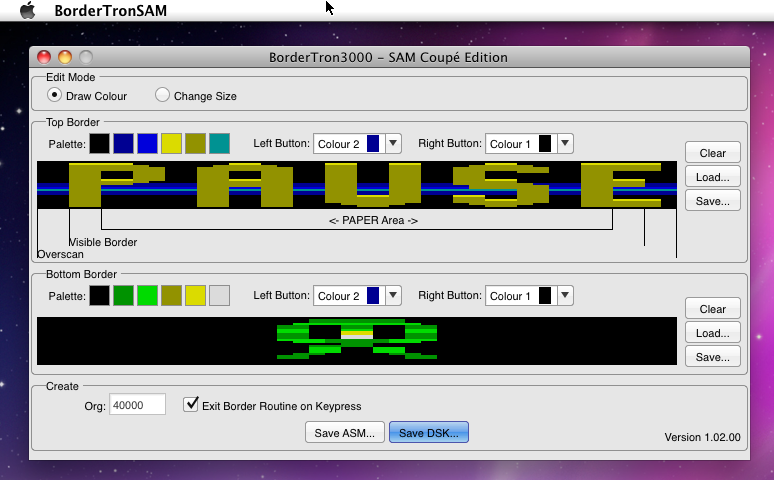 I’ve added (with much help from Simon Owen ) SAM Coupé support to “BorderTron 3000”, my Border graphics editor originally for the Spectrum. It lets you draw pictures, and spits out SAM *.dsk files that draw those pictures in the Border area of your SAM. http://freestuff.grok.co.uk/bordertron3000/sam/ - it’s a Windows executable, but it should be fine under Linux or MacOS with WINE.